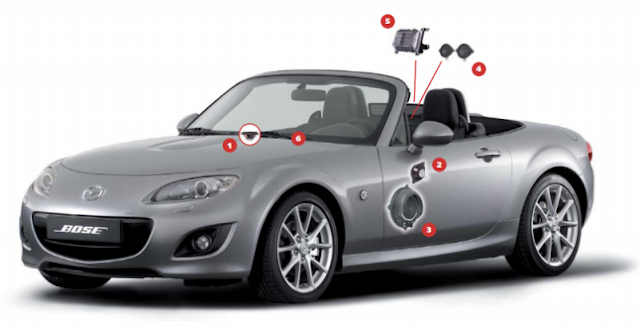 There were a range of factory audio options available for the third generation MX-5. 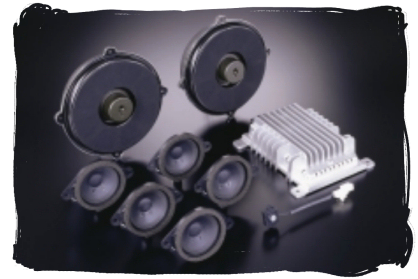 These stereo systems evolved over the years with more and more features becoming standard fitment. 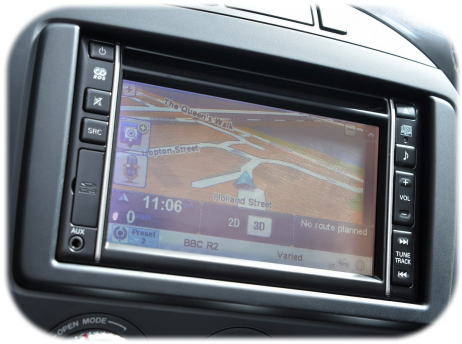 Additional functionality such as .mp3 playback, CD multi-changer, auxiliary input, Bluetooth, iPod compatibility, and satellite navigation were available on certain models or as optional extras. 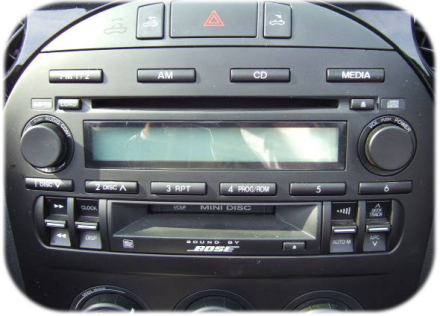 Mazda's factory stereo was a modular system similar to previous generations, it could be expanded and customised with extra units such as the optional minidisc and cassette players. 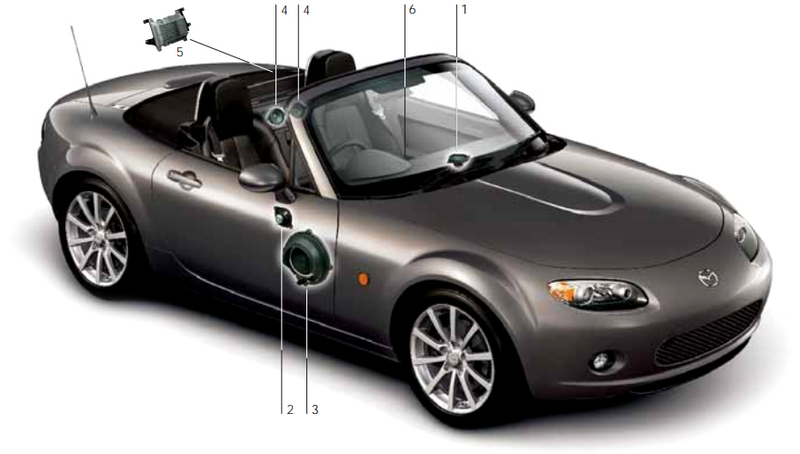 The speakers Mazda fitted to the MX-5 used neodymium magnets for less weight. The standard 6-speaker system used a pair of 5x7" 4Ω door speakers, a pair of smaller 8cm 4Ω door speakers, and another pair of 8cm 8Ω speakers at the rear. 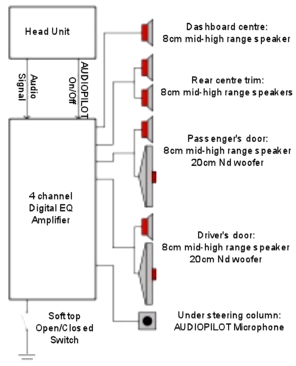 In cars with the basic 4-speaker setup, the smaller door speakers were not fitted. 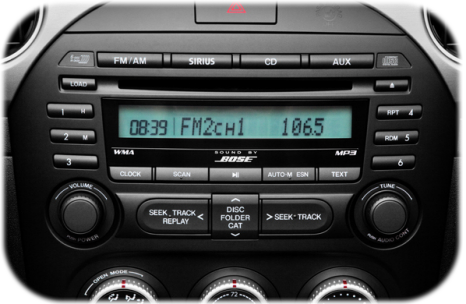 As with the older models, a premium Bose stereo system was available. The Bose system used six special speakers in the same locations as the standard stereo and also added a seventh speaker, a digital amplifier, and an AudioPilot microphone in the dashboard. This microphone was used to monitor ambient noise and adjust the stereo output accordingly. The digital amplifier included a 4-channel customisable equaliser and the system was able to detect when the roof was up or down. Now let's take a look at the various factory setups and options. 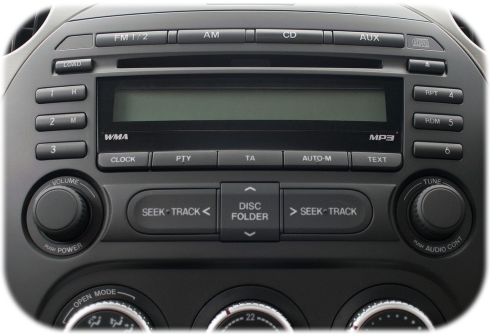 The picture below shows how the single CD standard headunit looked for these models. 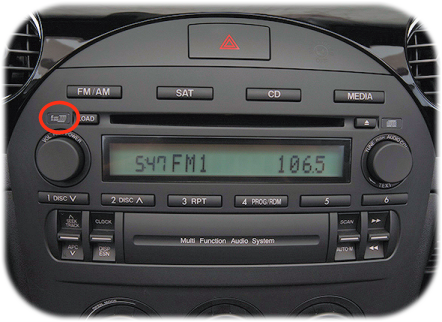 Note this is a USA model which has a slightly different button configuration (SAT for satellite radio) also note the blank next to the LOAD button. 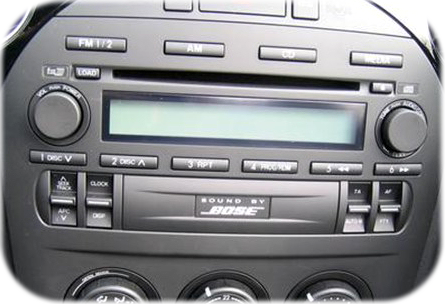 A 6 CD changer module was available as an optional extra, and was included with the premium Bose stereo in some markets. This changer unit is able to play .mp3 data discs. Here's how the standard unit looks with the CD changer fitted, notice the blank next to the LOAD button has been replaced with a new 6 CD label. The part number for this label is N12379BGX, and it costs about £2. The Bose unit looks almost identical to the standard, the only giveaway is the central trim piece now reads "Sound by Bose". Note the picture shows a European spec unit which does not have the satellite radio feature. There were optional expansion modules compatible with these early stereos. You could add a Mazda minidisc or cassette player into the space covered by the blanking trim that says "Multi Function Audio System". Fitting these required removing the headunit from the car and connecting the new module. A socket connection on the rear of the headunit can also be used to connect aftermarket adaptors for playing .mp3 files from USB flash drives, SD memory cards, and auxiliary inputs from portable media players. These devices can be found at various online stores and cost around £50. 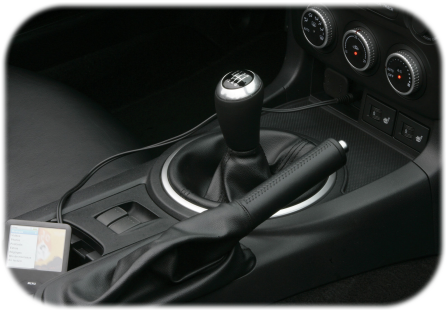 With the 2009 facelift all models were now fitted with steering wheel audio controls, and a 3.5mm Aux input next to the 12v socket in front of the gearstick. This Aux socket could be used to connect a portable media player. 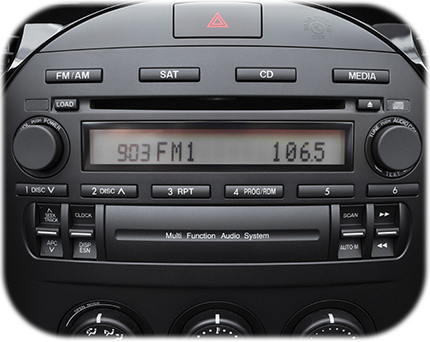 The 1.8 model was upgraded to the six speaker system and the new design single CD headunit was now able to play data discs burned with .mp3 and .wma files. A revised Bose stereo was now standard equipment on the 2.0 Sport Tech and Powershift. A new touchscreen navigation unit was introduced on the Venture special edition. Below you can see an example of the later headunit design. I don't think the original NC stereo was particularly bad, but to me this later one is much nicer looking. The controls have a smarter layout and the surrounding trim has a more sculpted appearance, especially around the heater controls. The headunit no longer says "Multi Function Audio System" and now has the MP3 and WMA labels below the display. The later model's Bose system gained an extra two channels on the adjustable equaliser for even more fine tuning of the sound. 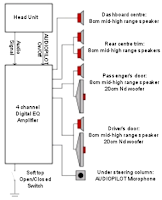 There was also an improved version of the AudioPilot noise compensation technology. As well as the Bose stereo, the Sport Tech and Powershift models also had an integrated Bluetooth system with steering wheel controls. This feature enabled you to make handsfree phone calls through the car stereo after pairing your mobile phone to the headunit. In the pictures below you can see the locations of the Bose stereo components, and the Bose version of the headunit with discreet logo in the centre. The 2012 Venture special edition model introduced a new touchscreen headunit with integrated TomTom satellite navigation. This unit also had a USB connection for playing mp3 files from flash memory, and RCA connection for connecting an audio/video source. The unit had its own Aux input socket so the Mazda one next to the 12v socket was blanked off. There single CD could read mp3 discs but there was no option for a 6 CD changer. The headunit was also capable of pairing with a phone via Bluetooth to make handsfree calls. You can read more details on this unit by clicking here. Stereo options didn't change much with the 2013 facelift. The navigation system previously seen only on the Venture edition became standard fitment on a new grade of model called Sport Tech Nav. 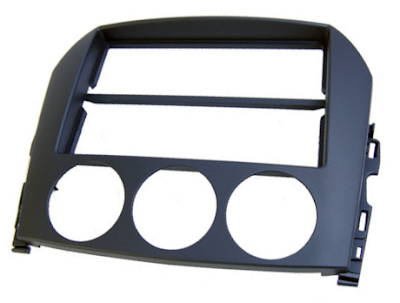 If you wanted to remove the factory headunit and install your own single or double DIN unit there are fascia adaptor trims available for a neat installation.